Read all about it! Read all about it! Round 3 Winners Announced! Are you looking for some great books on Wattpad? Want to read our immersive and entertaining overviews of said books? Then head straight for the chapters starting "Review". Do you think you may have written a really excellent Wattpad book, with the potential to stand out from the crowd? Are you looking for someone to review your book? Not just your first chapters, but all of them? Are you looking for more than just a single critic&apos;s subjective view? You&apos;ve arrived at the right place! Here on Wattpad, reviews are a fantastic resource for getting critical feedback on your works. However, many review books tend to focus only on the first chapters, meaning that the most important aspects of your book - plot, pacing, overall flow, character development and more - are neglected. What&apos;s a writer to do? 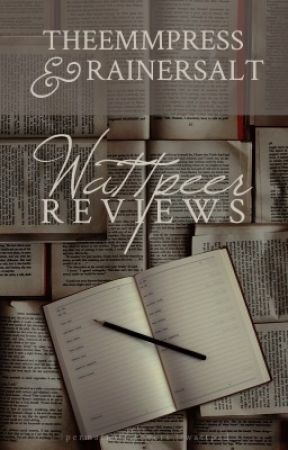 Submit to Wattpeer Reviews, that&apos;s what! At Wattpeer Reviews, you will get a thorough review of your entire book - focusing on the really important overarching questions: story, atmosphere, pacing, character development, etc. Not only that, but you will be reviewed by two, yes two, independent reviewers, cutting down on the subjective bias that can sometimes creep into single critiques. Sign me up! we hear you chant, how do I get involved? Well, like everything wonderful, Wattpeer Reviews costs—though it&apos;s probably not in the way you think. We don&apos;t require likes, comments, follows from you. But if you want a review, you have to make us want to review your book. That means it is not enough that a book is okay, or passable, or not-bad. Even good may not be enough. The first few pages of your story must really draw us in and make us want to read the whole thing. We are doing this in our free time, and that means we want to enjoy the books we are reading. Our stringent selection process (and the huge number of applications we get) means that not only is Wattpeer Reviews a review book, it&apos;s also a competition—where the winners get an amazing review as their prize. To recognise this, for our third round we&apos;ve added a new element: all books chosen for review will get a sticker to showcase their achievement! Wattpeer Reviews was founded by @theemmpress  and RainerSalt. We both love writing and good reads, and are active Wattpad users. Check out our profiles to learn more about us. We are slightly unusual for a review book in that you can only apply for a review during a limited application window. So we periodically open applications for a short time (say, a week), then choose the books we will review in that &apos;series&apos; from the application pool. When the reviews are done, we open again. If you add this book to your library or follow @theemmpress (this account) or RainerSalt you will be notified when applications open. If your book isn&apos;t chosen, you are very welcome to resubmit it in the next application window. Wattpeer Reviews will review your whole book. The review will be published here, promoting your writing to a new audience. We don&apos;t do chapter-by-chapter critiques, instead commenting on the book as a whole. We do this in a team of two, with the review reflecting both of our opinions. 1) Story: Did we like it? Did it draw us in? Was it believable? Did it bore us? What did we think of its plot? 2) Characters: Are your characters plausible, tangible, and relatable? How do they grow and change? Did they work out for us? 3) Feelings: How does your story feel? 4) Pacing: are there any parts of your book that feel slow, or rushed, or superfluous to the movement of the story? 5) Story structure: Did we recognize a structure in your story, such as the classical beginning-middle-end in three acts? Did we find a climax and resolution? 6) Theme: Is there a theme to your story, such as a recurring problem, trend, topic, or an aspect of human nature it explores? 7) Writing technique: What&apos;s our impression of your spelling, grammar, writing style, use of point of view, etc.? Here we will not address individual issues but give a general assessment. 8) Suggestions: Do we have any suggestions for improving the book? 9) Highlights: What did we enjoy most? 10) Audience: Who do we think would most enjoy this book, and why? Interested? Then go to the next chapter, The Rules.